Yesterday, my boyfriend and his roommates decided a trip to Virginia City, Nevada was in order. 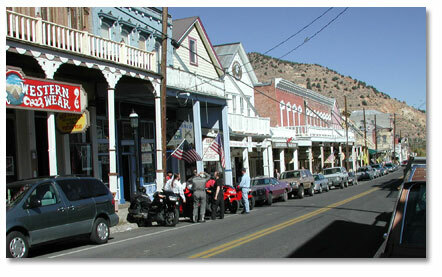 Virginia City was a boomtown back in the days of mining; the site of the Comstock Lode. Nowadays, it's a tourist trap, if you can even call it that. It's mostly stores selling hokey "western" wear and fancy rocks...and bars. There are so many bars in a two-to-three block radius. For breakfast yesterday, I just whipped up some homefries for breakfast. Before we left for Virginia City, I made a quick pb&j sandwich to hold me over. I collect postcards. I keep some and mail away most of them. I bought four postcards in Virginia City. I also found some incense I haven't been able to locate since I moved to California from Missouri. (It's called Fizzy Pop and it smells amazing!) When I found a store with it in Virginia City, I had to buy a little bit. Other than that, I only spent money on a bit of "entertainment" and some candy at the candy shop. When we finally left, we drove to Los Gallos in downtown Reno and I got a burrito that held me over for the rest of the night.